Marina Sunset is situated on the upper level of a bayfront cottage. 'INCREDIBLE' best describes the sunset views of Monroe Bay from the front deck of this gorgeous vacation rental on the 'Point'. This beautifully decorated and fully equipped two-bedroom unit sleeps up to 5 and offers everything you could possibly need for an enjoyable vacation, from bicycles to a karaoke machine! Our guests have full use of the back porch, patio, yard and grill. Perfect for a solitary retreat or a relaxing time with family or friends. Colonial Beach is only a 90-minute drive from DC or Richmond. You will not want to leave this lazy river town, bordered by the Potomac River and Monroe Bay, and where golf carts and boats are the main means of transportation! Enjoy our beautiful beaches and boardwalk, the town pier, museum, antique shops, town 'trolley', coffee shop and restaurants, boat charters, or just relax! Everything in town is accessible by walking, bicycle or golf cart (which you can rent in town)! We would love to have you at Marina Sunset as our guests! We are baby boomers with lots of energy and young at heart! Jim is a handyman and Glenda handles all the bookkeeping and management of the cottage. We love meeting new people and sharing our little piece of heaven, so this is just our cup of tea! Colonial Beach is a hidden gem of the Northern Neck. We lived in Richmond, VA, and came upon this lazy little river town while exploring one weekend. We fell in love with the quaint step-back-in-time feeling, and the natural beauty of this town so rich in history. And the people...everyone waves hello! So we packed up an moved here, and we just love this way of life and especially sharing it with visitors! We live downstairs, and Marina Sunset is on the upper level! You will immediately fall in love with the amazing views of Monroe Bay from the living room and front deck of Marina Sunset! Whether day or night, you will experience the tranquility of the beautiful wildlife, sailboats, and magnificent sunsets Golf-cart community, trolley, great beaches, town events, sightseeing, bird watching, boating, artist guild, antiquing, great restaurants, very relaxing atmosphere are all here for you in Colonial Beach within walking or biking distance of the cottage! this is a very large bathroom with a vanity and dressing area! Stretch of beautiful sandy beaches along the Potomac River within walking or biking distance of Marina Sunset. Colonial Beach is a seaside resort area, drawing visitors from all over. The town of Colonial Beach is nestled on the Northern Neck of Virginia, with miles of rural landscape and natural beauty. Quaint historic seaside town of Colonial Beach, surrounded by Potomac River and Monroe Bay. Colonial Beach has a very interesting tourist history dating back to turn of the century! Marina Sunset overlooks Monroe Bay, with its marinas, boats, kayaks, beautiful wildlife and majestic sunsets. Stretch of beaches along beautiful Potomac River. We do NOT povide a landline, so please be sure to bring your cell phone! Central A/C throughout with your own thermostat control. Central heating throughout with your own thermostat control. All linens, blankets and sheets provided at no extra cost. Washing machine located in back porch shared with downstairs residents. Front loading. You will need to bring your own laundry supplies intended for front loading machines. Clothes dryer located in back porch shared with downstairs residents. Guests have parking space on property in rear of cottage, enough for 2 vehicles. There is also room for small boats or trailer on lot next to property. Free Wi-Fi provided, we give you the secure WPA key to connect your laptop. All bath and kitchen bath towels provided at no extra cost. The Living Room seats approximately 4 adults comfortably. Full size frost free refrigerator/freezer with icemaker. Full size self cleaning electric oven with self venting hood. Counter top microwave with carousel. We stock an initial supply of paper towels, napkins, trash bags, coffee filters, and staples like salt and pepper. Fully equipped sunny bright kitchen. Kitchen has table seating for 4, in addition to breakfast bar for 2. Flat screen smart tv with amazon fire stick directv now and Hulu prime and Netflix. assortment of books in living room on shelf. Also magazines. Guests have use of backyard. We provide four 10 speed bicycles for cruising around town. We include a lock/key and helmets. 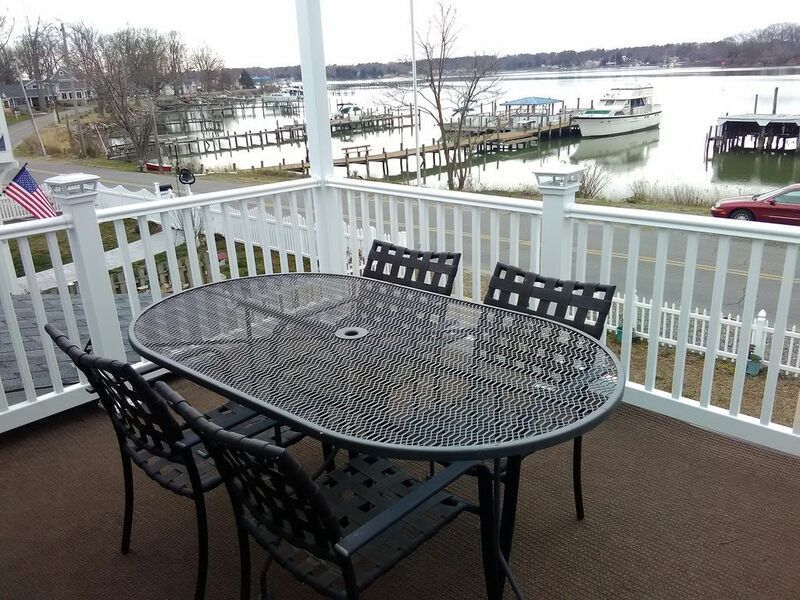 Front deck off living room on upper level, overlooking Monroe Bay. Outdoor table,chairs and lounges provided. Covered patio in back yard for guests with outdoor table & chairs. Marina Sunset is on the upper level, and only accessible through a stairway. Board games, puzzles, bicycles, boogie boards, beach chairs, portacrib, baby monitor, high chair, deck lounge chairs, karaoke machine. Fishing poles and other items provided by owners upon request...our aim is to give you a vacation to remember! Great view of the water and docks which we really enjoyed. We enjoyed some nice walks and two of the local restaurants. The Amazon Fire Stick battery needed replaced, but that was the only thing that we needed to problem solve! Great first time out of the city while visiting DC. This is the perfect spot for relaxing! I enjoyed my tea on the front porch every morning watching the crab boats bring in and replace their pots or the Osprey diving for breakfast. This is a beautiful spot and Jim and Glenda are simply wonderful hosts. The unit was clean and anything I needed was there waiting for me. Grocery store is close by. Really enjoyed walking around the bay and then looping up to walk along the Potomac. Truly a beautiful place. A wonderful place to stay to realign and refocus. We (me, my husband, son & his wife & two children) stayed at the cottage because of my son & granddaughter participating in the DC Spartan Run in Mechanicsville, Md. The cottage was very, very clean, which I appreciated very much. Nice selection of moves (fire stick), games on the porch. Area was very laid back, lovely for a quite walk in the morning. Nice little beach area for the grand girls to swim a bit. We used the grill one night to grill chicken thighs which was great. If ever back in the area will stay again. Thank you so much for the lovely review Robin. I am so glad you had a great stay and enjoyed Marina Sunset. By the way the beach here was just voted the best beach in Virginia in USA Today contest! I hope you got to walk the boardwalk and Town Pier when you were here! I should have told you to stop at Nancy's ice cream too! Have a great summer! thank you so much Mindy! We are so glad you enjoyed your stay. A trip to Colonial Beach is like stepping back in time to a simpler way of life! Enjoy the beautiful Potomac River beaches, collect shells and sea glass, go fishing, birdwatch, experience the sailboats coming in at sunset, shop the many antique shops and specialty stores, enjoy the waterfront restaurants, walk out on the town pier, stroll the boardwalk, visit our museum and ride the 25 cent trolley to get a historical tour of this lovely seaside town! Golf Carts in Colonial Beach are street legal, so you will enjoy seeing all various types passing along and beeping. Waving to everyone and saying 'hello' to strangers is not optional in Colonial Beach! Driving outside the town limits within 15 minutes drive, you will find Westmoreland Berry Farm, Westmoreland State Park, Monroe's Birthplace, Washington's Birthplace, Wineries and Golf, Just a little further, within an hours drive, is King's Dominion Theme Park, Fredericksburg sightseeing, and all that the beautiful Norther Neck has to offer! Active Military discount - 10% off all quoted rates. We will send you a revised payment request when you book and provide documentation. Discounted monthly rates will gladly be quoted upon request. If you are planning to stay more than 4 nights, please book a full week for the best rates (i.e. 5 or 6 nights will cost more than 7 nights).